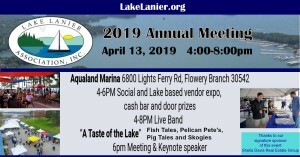 The Lake Lanier Association Annual Membership Meeting is coming up on Saturday, April 13 2019. We will be at Aqualand Marina this year. Below are more details about the meeting. If you arrive by boat, please park at the courtesy slips by the gas dock and walk up to the parking lot. We will be running a golf cart shuttle service from that parking lot to the meeting area. There is no cost for LLA members to attend. Non-members are welcome to attend and encouraged to join at the meeting. We also need volunteers to help us set up, run, and clean up the meeting. If you would be willing to volunteer at the meeting, please click on the below link to sign up. Thank you and we hope to see you there! We hope you will join us for the 2018 Annual Membership Meeting. We will be at Port Royale Marina on Saturday, March 24th. 4:00-6:00PM will be a lake business based vendor expo as well as candidate meet and greet. At 6:00PM, we will start our regular business meeting. Our keynote speaker this year will be Mark Masters, the Executive Director of the ACF Stakeholders organization. He will give us an update on the sustainable water management plan they have developed for the ACF basin. There will be live music, cash bar and, for food this year, we will be doing a “Taste of The Lake” concept with Fish Tales, Pelican Pete’s, Pig Tales and Skogies! There is no charge for our members to attend this event. If you are not a member, you can join via our website or you can join at the meeting. The below link is to a Dropbox account of the photos taken at Lake Lanier Association’s 2017 Annual Membership Meeting held Saturday, March 25th, 2017 at Port Royale Marina. Big shout out and thank you to LLA member George Wakefield for taking the majority of these great photos! Click here to see the Annual Meeting photos! FREE to attend for LLA members – registration is required. The 2016 Lake Lanier Association Annual Member Meeting will take place on Saturday, March 19th, 2016 from 4:00PM to 7:00PM at Pelican Pete’s at Port Royale Marina. The Lanier Crappie Anglers club will be doing a fish fry as snacks for the meeting. Pelican Pete’s will offer a cash bar. There is no charge for LLA members to attend this event but registration is required — see link on this page. Non-members are welcome to attend and are encouraged to join the LLA at the meeting. Come out and join the fun and get updates on current Lake Lanier issues and LLA projects. Tell your friends and neighbors! Don’t miss it! The 2015 Lake Lanier Association Annual Meeting will be held Saturday, April 18th from 4:00-6:00PM. 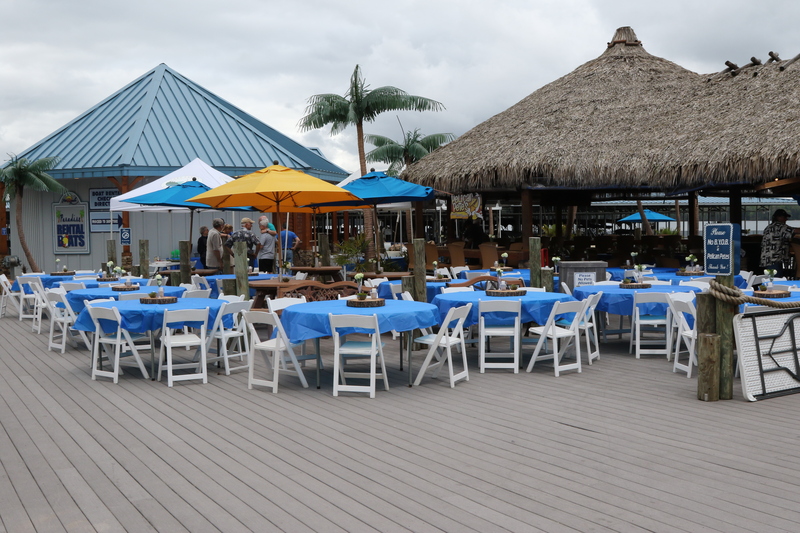 Port Royale Marina has graciously dedicated their Pelican Pete’s on the water restaurant space solely to our event! We will be under the big tiki hut for our meeting. Don’t worry fish fry enthusiasts – the Lanier Crappie Anglers Club will still be doing a fish fry as heavy hors d’oeuvres for us. We will be serving complimentary iced tea, lemonade, and bottled water and the full service bar will be open at Pelican Pete’s for you to purchase adult beverages on a cash basis. Be sure to get there by 4:30PM to get a door prize ticket. Meteorologist Ken Cook will be our keynote speaker and our meeting agenda will also include updates on the different lake based programs and services from the Lake Lanier Association. There is no charge for current Lake Lanier Association members to attend this event. Non-members are welcome to attend and encouraged to join the LLA at the meeting. After our meeting ends at 6:00PM, you are welcome to stay at Pelican Pete’s and enjoy live music. 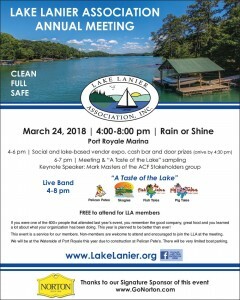 The Lake Lanier Association 2014 Annual Member meeting is coming up this Sunday, April 27th at the Carriage House Pavilion at Lake Lanier Islands. The candidate meet and greet portion of the meeting starts at 4:00PM and the business portion of the meeting begins at 5:00PM. We have over 25 local, state, and federal elected officials or candidates for office that will be in attendance for our members to meet and talk to regarding their interests and concerns. Frank Norton, Jr. will give an outlook presentation regarding economic trends and market activity related to Lake Lanier. 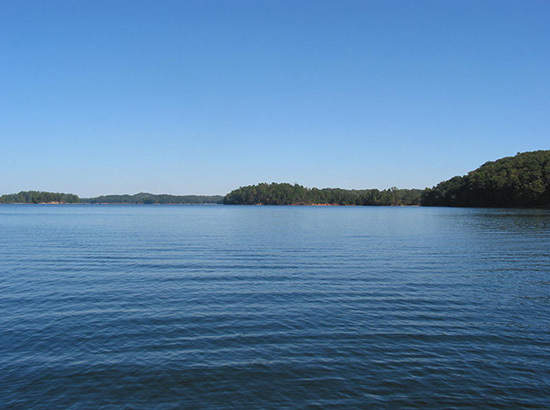 We will also have updates from the Corps of Engineers on several of their Lake Lanier related projects, and, of course, we will give an update on all the different projects and services offered by the Lake Lanier Association to the lake community. There will also be several local lake-related businesses in attendance for you to get updates on products and services that are of interest to you as a lake recreational user, merchant, or property owner. Lake Lanier Islands at Sunset Cove, will be hosting an In The Water Boat Show this weekend. If you want to come out early and see the boats prior to the start of the Annual Meeting, you are encouraged to do so. This meeting is presented as a member service. There is no fee for members to attend this meeting. Non-members are welcome to attend and encouraged to join at the meeting! We hope to see you there. Please join us for the Lake Lanier Association 2014 Annual Member Meeting! By car, park in the Grand Hall parking lot and walk to The Carriage House. By boat, dock at Sunset Cove and walk along the sidewalk around to The Carriage House. Meet elected officials and candidates for office for local, state, and federal positions. Updates from the Lake Lanier Association on activities over the past year as well as programs and initiatives for the upcoming year. Keynote Speaker Frank Norton, Jr. will present economic outlooks and real estate market trends around Lake Lanier. Corps of Engineers Project Manager Tim Rainey will give updates on several Corps initiatives. Light snacks and complimentary soft drinks will be served. There will also be a cash bar available. This event is provided as a member service. Non-members may attend and are encouraged to join at the meeting. Hors d’oeuvres and non-alcoholic drinks will be served. There is no fee for LLA members to attend this event.